Laurence Stallings, who graduated with a master’s degree from the School of Foreign Service in 1922, turned his experience as a wounded veteran in the First World War into inspiration for a career as a journalist, author, and playwright. Laurence Tucker Stallings was born on 25 November 1894 in Macon, GA, to Larkin Tucker Stallings and Aurora Brooks Stallings. In 1912 he matriculated to Wake Forest University, where he became the editor of the literary magazine on campus, Old Gold and Black. It was there where he met his first wife, Helen Poteat, the daughter of the university's president. In 1916, Stallings graduated from Wake Forest and got a job writing advertising copy for a local military recruiting office. Then, in 1917, he joined the United States Marine Reserve. On 24 April 1918 he left Philadelphia aboard the USS Henderson for overseas duty in France. Stallings served in France as a platoon commander with the 3rd Battalion, 5th Marines, during the fighting at Chateau-Thierry. 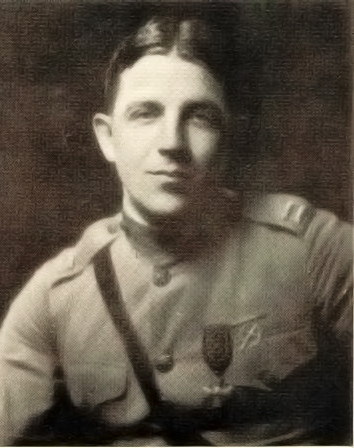 At the Battle of Belleau Wood, Stallings was shot in the right leg leading a successful assault on an enemy machine gun installation. He was promoted to captain, awarded the Silver Star, and given the Croix de Guerre by the French government. Although he begged not to have the leg amputated, a wish respected at the time, he would have to have it amputated in 1922 after a bad fall on ice. He began work on his novel Plumes while recovering at Walter Reed Hospital. Stallings was no longer able to serve due to his injury and returned home to the United States. Stallings married Helen Poteat on 8 March 1919 and had two daughters, Sylvia, born in 1926, and Diana, born in 1931. Stallings then attended the School of Foreign Service, where he received his master’s degree in foreign service in 1922. After graduation he began working as a reporter, critic, and entertainment editor at the New York World. 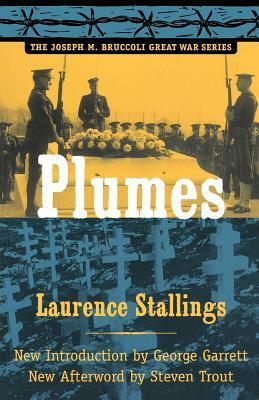 Perhaps Stallings’s greatest work was his pseudo-autobiographical novel Plumes, which told the story of Richard Plume, a U.S. Marine whose combat injuries cost him a leg and much of his faith in government and society. The novel was published in 1924 and became a huge success, with nine printings in that year alone. The novel was so popular, in fact, that it was adapted into King Vidor’s 1925 film The Big Parade, which was MGM’s largest-grossing film until Gone with the Wind in 1939. Stallings’s career in the arts and entertainment blossomed when he began to collaborate with playwright Maxwell Anderson. 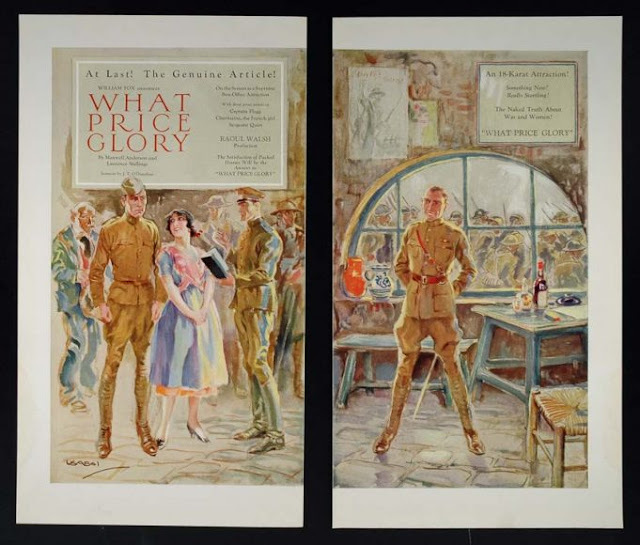 The two co-wrote several plays together, their first and most successful being What Price Glory, a comedy-drama which depicted the rivalry between two U.S. Marine Corps officers fighting in France during WWI. What Price Glory opened at the Plymouth Theatre in New York City in 1924, ran for 435 performances, and was adapted twice for film. Stallings and Anderson went on to co-write two more plays—The First Flight and The Buccaneer, both of which premiered in 1925—before going their separate ways. Stallings continued to work in theater. He wrote the book and lyrics for the musical Deep River, which ran briefly in October of 1926. He co-wrote the book for the 1928 musical Rainbow with Oscar Hammerstein, adapted Ernest Hemingway’s A Farewell to Arms for the stage in 1930, co-wrote the book for the 1937 musical Virginia, and he wrote the play The Streets Are Guarded, which premiered in 1944. After this big success, Stallings served as a key influence for several of John Ford’s greatest films, having wrote or co-wrote 3 Godfathers, She Wore a Yellow Ribbon, and The Sun Shines Bright. He is also credited for contributing to the screenwriting of Vidor’s Northwest Passage, as well as Leslie Fenton’s The Man from Dakota and On Our Merry Way. Not to mention his book "The Doughboys, the story of the AEF" - an essential book on the US in WWI. In 1933, Stallings published a photographic collection entitled "The First World War". Amen! I loved the Stallings book, "The Doughboys." One review did write: "This book contains the reflections of one man (like William Manchester's World War II memoir Goodbye Darkness) and its value is in setting the "tone of the times," not for its rendering of facts. History it is not, a good read it is."